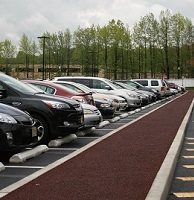 Rubberway is a flexible, porous, unitary paving system made primarily from recycled tire rubber. This environmentally-friendly alternative to concrete and asphalt is used for porous pavements, sidewalks, tree wells, parking lots, park trails, running tracks, stormwater management and more. This sustainable, porous rubber paving alternative has been implemented throughout the U.S. to solve a multitude of challenges related to sidewalk and pavement infrastructure. Rubberway porous rubber surfaces are a low impact development technology that provides stormwater management as well as an overall safe, non-slip, resilient surface. 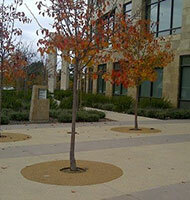 These surfacing systems are eligible for LEED credits and allow for flexibility and customization in design. Rubberway is a practical, distinctive, environmentally friendly solution that will beautify, protect, and preserve our cities for future generations. 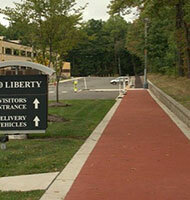 Rubber Sidewalk is Rubberway's patented, flexible, and pervious solution to cracked sidewalks. This modern, environmentally friendly system is safe, non-slip, and porous, allowing for drainage and stormwater management. Rubber tree wells are a patented system by Rubberway uniquely designed for tree care. This flexible, porous tree surround creates a healthy environment for the tree and its roots by allowing air and water flow, thereby encouraging deep rooting and reducing the risk of trip hazards and sidewalk cracking. Flexible porous rubber pavement suitable for heavy duty usage such as parking lots, driveways, walkways, trails, paths and running tracks. Resilient, yet firm enough to be suitable for more high impact use such as light vehicular traffic while providing storm water management. Rubberway rubber trails and paths are made from recycled rubber, making them flexible and comfortable for walking and jogging without the impact of harder surfaces like cement and asphalt. These rubber pathways are also porous, providing a quick drying, non-slip surface. 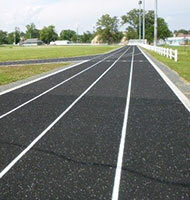 Rubber running tracks offer pedestrians and joggers a low-impact, good traction, firm yet resilient surface. 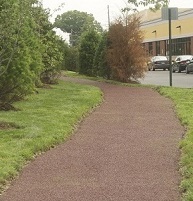 These porous rubber running and jogging trails provide a comfortable surface for training while also aiding in stormwater management. Multi-purpose Rubberway systems have been installed as rubber flooring on rooftops, as a pool deck coating on pool surrounds, on patios and decks, beneath climbing walls, and in gyms and CrossFit centers. If you dream it, we can do it! 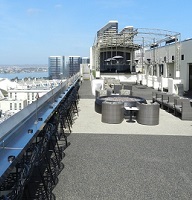 Rubber surfacing material supply including everything you need to install and maintain our specialty Rubberway systems. 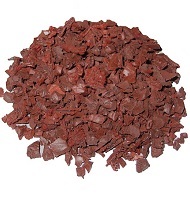 Recycled rubber granules, epdm, binder, installation kits, and more.